Available from newsagents, bookshops and Amazon or order your copy here (allows 14 days for delivery) The first 200 orders will get a free book while stocks last. Want to know what 2015 will be like? The Prediction Annual is your essential guide to love, life and career success. Be prepared for the forthcoming year with comprehensive monthly forecasts for each star sign in the year ahead what you can expect in terms of love, money, work and home life. And that’s not all. The Annual also contains your Chinese and Vedic horoscopes, week by week astrological predictions for what we expect to see in the news for 2015, and a tarot reading for the year ahead. With the 2015 Prediction Annual, you have all the answers in your hand. The book is bursting with all the essential astrological information you need to make the very best of the coming year. Kim Farnell is an author, editor and astrologer with an MA in Cultural Astrology and is currently President of the Astrological Lodge of London. She has written numerous books and articles on a wide variety of subjects, taught astrology and lectured on astrological subjects in the UK and overseas and has appeared on TV and radio as an astrologer. Her horoscopes have been published in numerous magazines in the UK, Australia and New Zealand, as well as on many websites. Suzanne Corbie has read and studied the tarot for thirty years and regularly teaches classes and workshops in tarot around the country. She has a wide range of esoteric knowledge and experience and is passionate about anything that promotes spirituality, understanding and wellbeing. Victoria Matthews has written articles on Chinese astrology for Prediction magazine for over twenty years. Sonal Sachdeva is a film-maker and an astrologer. She studied under Liz Greene at the CPA and is currently a committee member of the Astrological Lodge of London. In 2010 she founded a group in London called the Circle of Divine Astrology, which holds events, discussions, talks and multimedia projects. Peter West has written nearly thirty books and has been a professional astrologer for nearly sixty years, thirty-five of them as Prediction magazine’s leading technical expert and columnist. Over the years, he has written a vast array of articles. 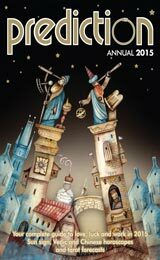 Be the first to review “Prediction Annual 2015” Click here to cancel reply.